Until recently, the oldest anthropoids came from Africa and that was assumed to have been their place of origin. New discoveries from China and Thailand have changed this perception according to some palaeobiologists, but others deny it. The first shot across the bows of the Africanists came from Beard etal. (1994) when they announced the discovery of Eosimias, a tiny animal from China, known from several jaw bones. They interpreted Eosimias as the first anthropoid, older than the oldest African material. The shift of focus to Asia continued with further discoveries from China and from Thailand. 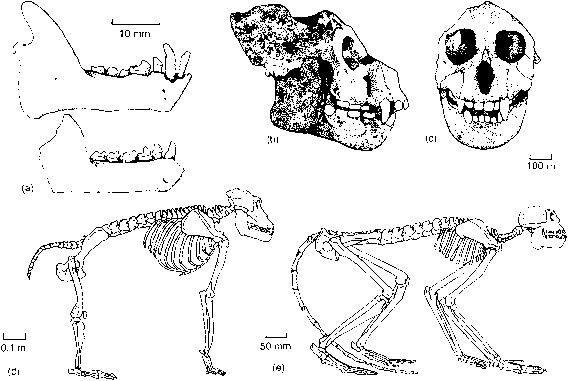 The material from Thailand (see illustration) includes Pondaungia and Amphipithecus which had been named in the 1920s and 1930s, as well as new forms, such as Siamopithecus (Chaimanee et al., 1997). The proponents of an Asiatic origin for anthropoids (e.g. 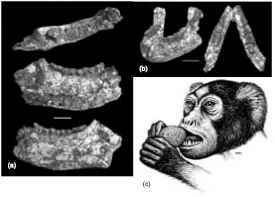 Beard et al., 1994; Chaimanee et al., 1997) point to similarities in the teeth and jaws of the Chinese and Thai specimens to African anthropoids. These views have been criticized however. 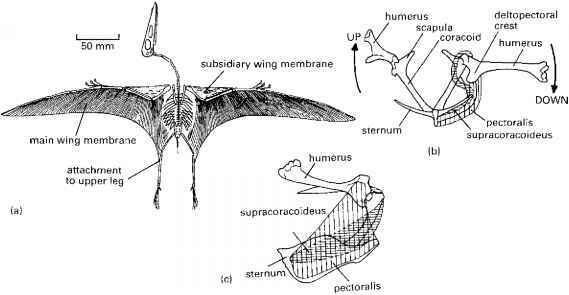 Ciochon and Gunnell (2002) argue that none of these specimens is anthropoid. Their discovery of postcranial remains suggests that the larger Asiatic forms (Amphipithecus, Pondaungia, Siamopithecus) are in fact adapiforms similar to Smilodectes (see p. 366), a group that is firmly at the base of primate radiations, part of the Strepsirrhini (see Box 11.1), and nothing to do with anthropoids. The Asiatic primate specimens lack certain anthropoid dental characters, as well as the postorbital septum, and other features. Other Thai specimens are reclassified as omomyids. But what of Eosimias from China, and relatives from Thailand? Kay et al. (1997) are convinced that the eosimiids are indeed haplorhines and anthropoids, whereas other authors place Eosimias close to the tarsiers, and hence outside Anthropoidea. Gebo et al. (2000) present a strong case, based on the ankle bones of Eosimias, that it is indeed an anthropoid, so the Asiatic versus African origin debate is still wide open. The oldest African anthropoid appears to be Algerip-ithecus, a parapithecid from the middle Eocene of Algeria, based on isolated molars. Catopithecus, an oligopithecid from the upper Eocene of Egypt (Simons, 1995), is more completely known. It has two premolars, large upper canines and flattened spatulate incisors. Catopithecus specimens show pronounced sexual dimorphism, with males apparently twice the size of females and equipped with much larger canine teeth (Figure 11.3(a)). Aegyptopithecus, a propliopithecid from the Oligocene of Egypt (Figure 11.3(b, c)), has a short snout, large forward-facing eyes and an enlarged braincase. The heavy jaw and broad cheek teeth suggest a diet of fruit, and the limb bones show that Aegyptop-ithecus probably climbed trees and ran along stout branches. linking transverse pairs of cusps, the bilophodont condition. Modern cercopithecids divide into two groups, the cercopithecines, such as the macaques (Figure 11.1(d)) of Africa, Asia and Europe (the barbary 'ape' of Gibraltar) and the terrestrial baboons and mandrills, and the colobines, the leaf-eating colobus monkeys and langurs. The oldest fossil evidence of cercopithecids is from the lower Miocene of Africa. Victoriapithecus, a cercop-ithecid from the middle Miocene (15-14Myr ago) of Kenya, has bilophodont molars and it probably fed on fruit (Benefit and McCrossin, 1997). By the late Miocene, cercopithecids had extended their range across the Old World, as far as China and Java and Eu rope, and in the Pleistocene such monkeys reached as far north as England. As many as ten cercopithecid lineages took to the ground and they replaced the ground-dwelling apes in parts of Africa. Modern genera of cercopithecines appeared in Africa during the Pliocene and Pleistocene. The living gelada, Theropithecus, a specialized ground-dweller related to the baboon, lives in the Ethiopian highlands and feeds on grass and seeds. The Pleistocene relatives were larger than the modern species, some of them much larger (Figure 11.3(d)), and they are common at East African fossil sites and their range extended as far as India and Spain. Miocene. Colobines entered Asia and Europe before the cercopithecines and diverged into distinctive groups in those continents. Mesopithecus from the upper Miocene and Pliocene of Europe and the Middle East (Figure 11.3(e)), is a short-faced form, similar to modern langurs. It has a deep lower jaw, as in all colobines, an adaptation for chomping huge amounts ofleaves. Living platyrrhines are divided into two families, the Cebidae (capuchin and squirrel monkeys, tamarins and marmosets) and Atelidae (howler and spider monkeys, saki, owl and titi monkeys; Figure 11.1(c)). All of these are confirmed tree-dwellers, and they are either herbivores, feeding on fruit and leaves, or omnivores, with the addition of insects and small vertebrates to their diet. The fossil record of platyrrhines extends back to the late Oligocene, but remains are sparse (Fleagle and Rosenberger, 1990). One Pleistocene form, Protopithe-cus, was larger than any living atelid, weighing an estimated 25kg (Hartwig and Cartelle, 1996). The platyrrhines probably split from the catarrhines in the Eocene, about 35Myr ago (Schrago and Russo, 2003), and they may have reached South America direct from Africa, crossing the opening South Atlantic Ocean.